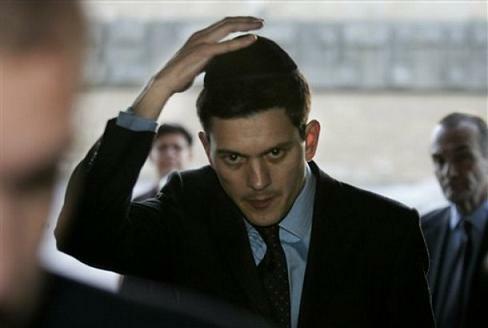 WILL it be David Miliband or Ed Miliband to lead the Labour Party? Cranmer explains that it matters not who they are because they are just Jews. In the Channel 4 show Miliband of Brothers, the producers saw fit to stick a big Palestinian flag on a wall in the Miliband family home. Was it factually accurate or just a cheap nudge? And why the Palestinian banner when in the olden days of the 60s and 70s – before rolling news and a stronger more aggressive Israel – it was the Jewish state that was the underdog? On October 6, 1973, Syria and Egypt attacked Israel on Yom Kippur, the holiest day of the Jewish calendar. The underdog won. Britain was a less a anti-semitic place then and people cheered. “But Labour wants to destroy Mr Howard as a political leader by using his Jewishness against him. They know to a hair’s breadth what they are doing. The Labour Party also depicted Michael Howard and Oliver Letwin – who are both Jewish – as flying pigs. THE only thing that is certain about the nail-biting contest to lead the Labour Party is that a Jew will win. In this ‘aggressively secular’, enlightened 21st century, it is supposed not to matter. But, of course, it does. David and Edward Miliband (henceforth Daveward) come as a package. Whichever wins, the other will be his symbiotic sidekick. While one half is considered the heir to Blair and the other the political soul-mate of Tony Benn, they are both steeped in Marxism through the influence of their Brussels-born, Polish emigré father Adolphe (Ralph) Miliband. Whatever Daveward says on Israel, Jerusalem, Gaza and the ‘two-state’ solution, he will be cast as a Zionist. When he calls for a strong, independent and secure Israel, he will be Islamophobic. Should Daveward ever attend an event organised by Labour Friends of Israel, he will be one of the Jewish mafia. If ever he mentions that 80 members of his family were slaughtered in the Holocaust, many of them in Auschwitz, he will be accused of peddling propaganda. When he expresses concern about Iran’s nuclear ambitions and the threat they pose to stability in the Middle East, he will be cast as an ambassador for Israel. When Daveward condemns trade union calls for economic and academic boycotts of Israeli goods and services, he will be accused of condoning Israel’s brutal terrorism and ethnic cleansing. Whenever he meets with a fellow Jewish politician, financier, or philanthropist, he will be accused of lobbying for Jewish values. Whenever he dines with the editor or proprietor of a newspaper, he will be part of the global Jewish conspiracy to control the media. If ever Daveward celebrates Rosh Hashanah or commemorates Yom Kippur, G_d forbid that he utter Shana Tova U’Metuka. The United Kingdom has become the anti-Semitic capital of Europe. Daveward will need the wisdom of Solomon and the conviction of Elijah to confront it. The Conservative Party had its first Jewish leader in 1852: Benjamin Disraeli was the country’s first and thus far only prime minister who was born Jewish. It remains to be seen whether Daveward will give the country its second and lead Labour to its Promised Land.